Randy Speer| Staff Writer "The Mount"
He is a man of mystery at Mount Michael. With his Spanish speaking skills and an impeccable swooping haircut, Joseph Kapusnick is also a man with many stories. Originating from the east coast, Kapusnick went to a college prep school much like Creighton Prep. While there, he excelled in extemporaneous speaking. He stood out in his competitions, qualifying for Nationals, but the awards were not the only thing he gained from speech. 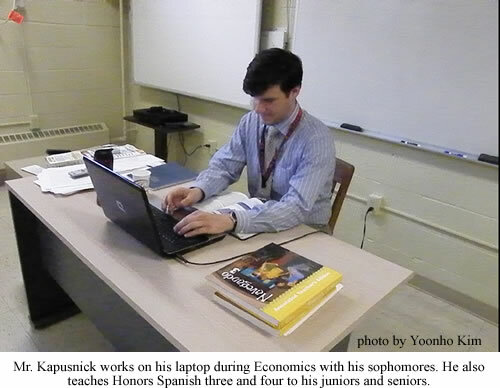 Kapusnick’s experience in high school speech was very formative, and changed the direction of his studies from the sciences to political affairs. He said, “This became the basis of my decision to go to Georgetown’s School of Foreign Service for college. More than my interests, though, speech was where I met my closest friends, many of whom I still keep in touch with today,” he said. Kapusnick had experiences in competitions. He qualified for final rounds at Harvard, Yale, and Princeton, and was invited to participate in a national 16-person extemporaneous speaking competition. “Along with being comfortable speaking in a crowd, this lesson of defeat was the greatest asset I gained from my forensics experience. As a co-president of the team, I had to deal with a poor performance at a large away tournament in a way that set a good example for the rest of the team, and especially for underclassmen,” Kapusnick said. He then went off to college at Georgetown, which also had a large impact on his future. Georgetown was a great experience for Kapusnick because of the people he met and the experiences that exposed him to more of the world than ever before. Classes were interesting and thought provoking, but two experiences stick out more than any others for him. “The first was my study abroad semester in Ecuador. This time out of the country let me see the developing world that I had been studying in class, and forced me to question many assumptions that I—and my professors—seemed to have made,” Kapusnick said. It was in Ecuador that he first started to delve deep into the Spanish language. He had taken some Spanish beforehand, but he was much more interested after he got back from Ecuador. “I really developed a passion for Spanish, and language in general, through my study abroad experience in Ecuador. It was truly amazing to be able to communicate and experience daily life in a different culture and language,” he said. He was so inspired by his experience that he continued to take Spanish literature courses after returning and began intensive German courses at the same time. Kapusnick is not only fond of the Spanish language, but also of the east coast. He loves the public transportation, the wide range of things to do, and especially being close to the ocean, but he has found the Midwest pace of life to be equally enjoyable. “I have enjoyed the slower pace, the beautiful landscapes, and been pleasantly surprised by all of the rich and interesting activities the Omaha area offers. I’m looking forward this spring and summer to exploring some of western Nebraska and the Dakotas, which I have heard are absolutely beautiful,” said Kapusnick. Overall, Kapusnick has enjoyed his first year at Mount Michael, and has high hopes for the coming years. “I have enjoyed the welcoming attitude of the faculty and students, as well as the enthusiasm of students in learning and their willingness to be challenged,” he said.